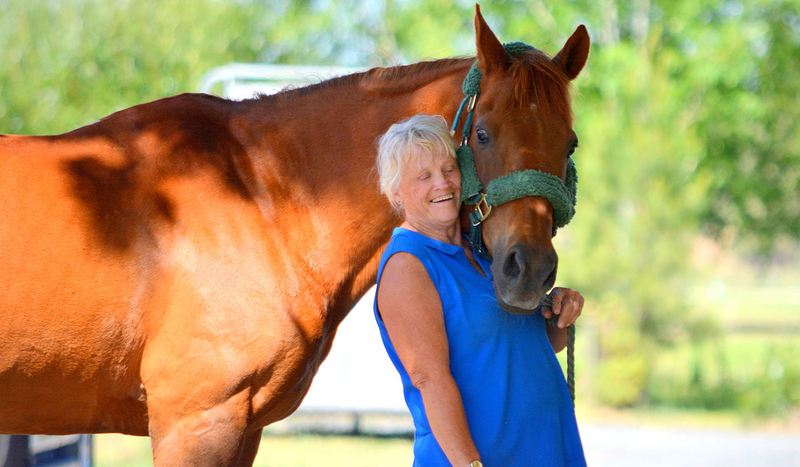 Sue Jackson is an equine massage therapist specializing in equine sport therapy. 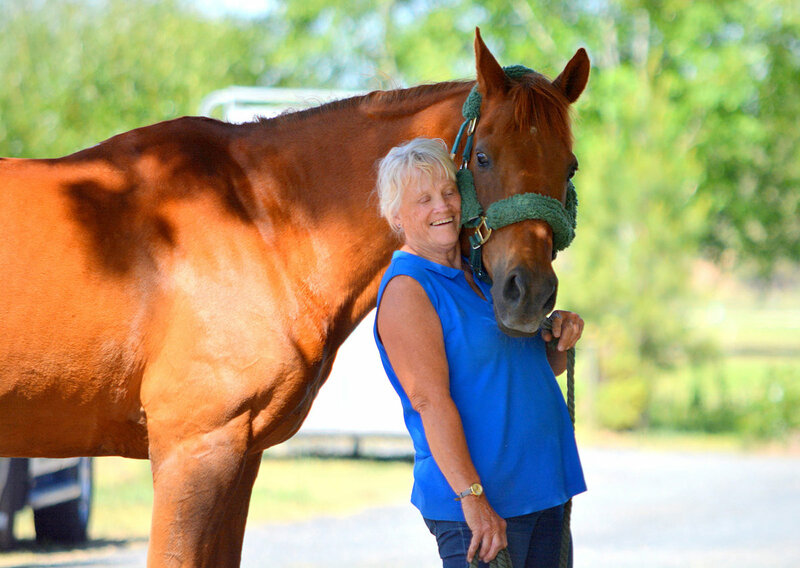 With a background in physical therapy and massage therapy in humans, Sue didn’t originally plan on mixing her two passions of healing and horses until 1990. 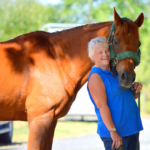 A champion for keeping horses as healthy and happy as they can possibly be, Sue believes equine massage therapy prevents and reduces the effects of injuries and joint problems in horses. I’m Red, and I’m a stunning (if I do say so myself) 23-year-old, half-thoroughbred, half-Arabian horse. I may be getting up there in age, but I certainly don’t show it! My person, Sue Jackson, says I’m a young spirit, and we love to stay active together by going on trail rides and participating in sports such as dressage. I’m always approaching the world with a wide-eyed curiosity, happily greeting every person and horse I meet. We live next door to my best friend, a Mustang, who I run around and play with. My favorite treats are pellets with berries, but you can bet that I have to earn them first! Sue had been looking for the perfect horse like me since she was ten years old and her father decided she was ready for a horse of her own. While she’s had 10 horses throughout her life, our bond is unique and special. On the day we met, I was already 18 years old, but Sue knew we’d be a match made in heaven. She will often say that I chose her, but I believe we chose each other. 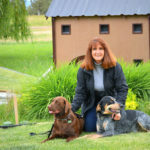 Lori Hayden is a retired police officer originally from California, with an extensive background in training and handling K9 police dogs. Dogs have been an integral part of her life since she was a little girl, where she trained her first dog at the age of ten. Lori was also a professional skateboarder at the age of 19, and stunt doubled for Linda Carter in Wonder Woman. Currently, she lives in Redmond where she continues to raise and train dogs. Her two important rules for dog training are 1) Never ask your dog to do something that you can’t reinforce, and 2) “Your dog should absolutely adore your trainer,” Hayden says. Hello, I’m Blue, and I’m a two-year-old Bluetick Coonhound. The ultimate key to my heart is a “doggy dollar”—a yummy, circular beef snack that I’ll happily do anything to earn. I’m a really good boy because of my person, Lori, who has been a dog trainer for many years, and has taught me everything she knows about obedience. I feel like the luckiest dog in Central Oregon to live on so much land, and to be able to be around horses, cows, and other dogs every day. My best friend is Nelson Ellsworth, a one-year-old chocolate lab who gets to hang out with me and Lori around the barn. 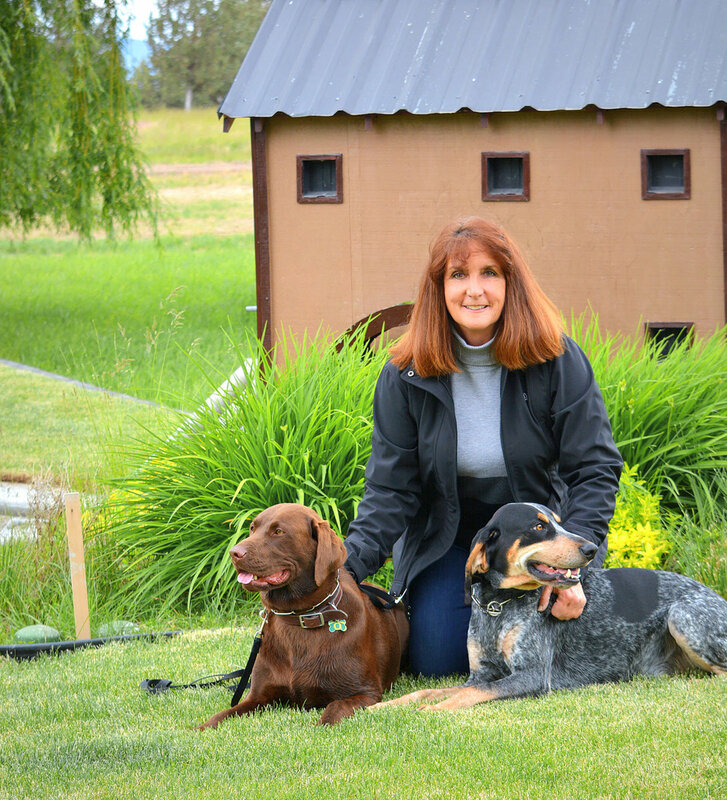 Lori is Nelson’s trainer, and she has worked hard on teaching him to be an outstanding canine citizen. Boy, has he come a long way! While Lori has taught him a lot of valuable skills, I definitely take some credit as her teaching assistant. Nelson used to be so scared of little things like walking across slick floors in the house, but I helped him conquer his fears by walking right by his side. 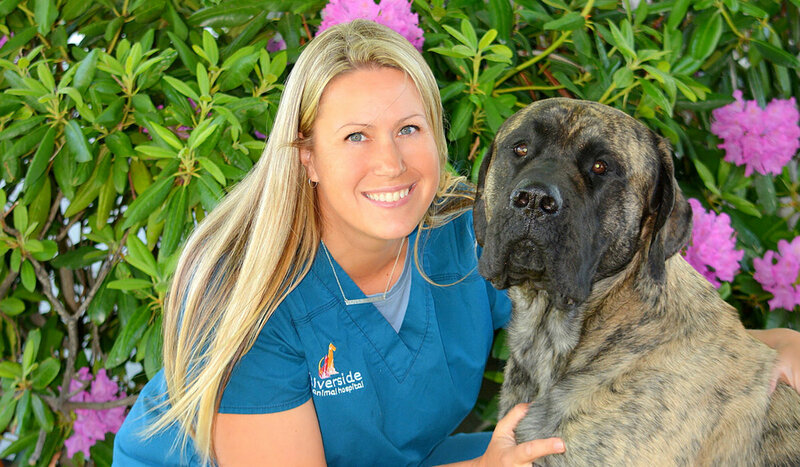 Jaimie Sines is the Hospital Administrator at Riverside Animal Hospital in Bend. 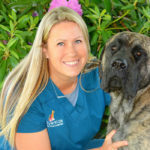 She believes that the best part of her job is working alongside the staff and doctors, getting to know clients (both human and furry friends), and helping out with the care of animals that come to the hospital. Riverside Animal Hospital specializes in the veterinary care of dogs and cats. The hospital is committed to providing exceptional veterinary care and individualized attention in a compassionate and welcoming environment. Hey everyone, my name is Olie, and I’m a 117-pound, two-year-old Mastiff. As a giant breed of dog, I’ve got a heart that’s just as big. I’m one lucky dog, because I get to go to work every day with my person, Jaimie, who works at an animal hospital right here in Bend. When Jaimie is working, I like to spend my days taking long naps under her desk, playing tug of war, and wrestling with my best dog friend, Busy, who also gets to spend the day with his person. One of my favorite things about being at work with Jaimie each day is being able to greet all the people and pets who come into the lobby. When I’m not at the animal hospital with Jaimie, I get to hang out at home with my favorite little humans, her kids Cedar and Thatcher. We love to play all day—exploring the outdoors, chasing each other through the fields, and playing with the sprinklers in our yard when the weather is nice—which seems to be all the time during summer in Central Oregon. I think it’s safe to say that life with my family in Bend is a pretty sweet one.